This is my comment on the 2010 paper by Michael E McDonald and John P Paul. 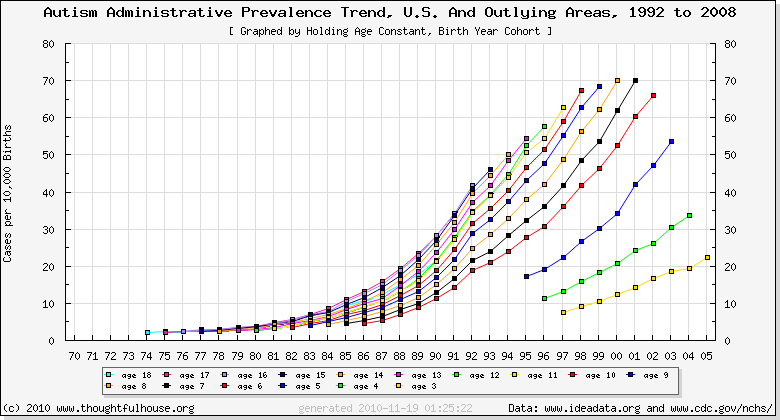 "Timing of increased autistic disorder cumulative incidence" Environ. Sci. Technol. 44, 2112-2118. The authors reckon that they can usefully analyse the autism increase curve by making an approximation of it in terms of two straight lines. They then point out that the junction of the two lines, the "changepoint", at which they suggest the autism increase began, is about 1988-9. In reality, just about any curve of roughly exponential increase form can have a couple of straight lines imposed on it such as to passably plausibly account for the entire data set. Especially if you set the time axis long enough so the increase will look like an abrupt event rather than a gradual one. Nice correlations can be found for each line with its corresponding part of the data, and impressively high significance levels pointed out. It does not however follow that the increase is usefully understood in terms of such pairs of lines. The paper of McDonald and Paul features remarkably small graphs of the increase, which tend to give the impression that there was no increase before their "changepoint". And they use a whopping 50-year timespan. It would be better to have larger (taller) graphs around the critical period so we can examine the end of the "level" section more closely. It should be quite obvious from this graph that there was not some abrupt changepoint around 1988, and not around any other year either. 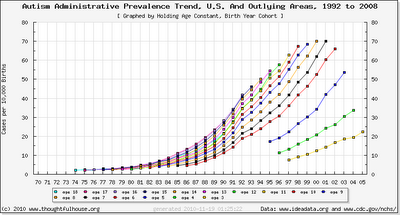 Furthermore there is a conspicuous de-steepening of the gradient at 1992-3. I expect that this was due to some minor improvement of the amalgam usage protocol, such as avoiding for pregnant women, a slightly less toxic formulation, or improved suction systems. I would not have commented on this "changepoint" paper except that it has been cited by Andrew Wakefield and some Age of Autism people as supposedly showing that the start of increase coincided with some changes in vaccination usage. No it didn't.